Hotel Norge first opened its doors in 1885 and since then has become iconic and one of Bergen’s most prominent hotels. On 29th of June 2018, the hotel reopened after a full refurbishment, and is now an iconic and modern hotel and lively meeting place, where local meets international in a vibrant and unique atmosphere. The architects have gathered inspiration from the nature surrounding the city. Therefore, the interiors reflect high quality, modern, Nordic design with many distinctive details. Our hotel has 415 new and stylish hotel rooms with beautiful floor-to-ceiling windows, inviting in the mountains, light and city atmosphere. If you want a room with a view, you can book a view room towards lake Lille Lungegardsvannet, or you can choose a balcony room if you want your own balcony. If you’d like some extra luxury, you can stay in one of our 7 large and spacious junior suites, or our Master Suite, The Dolk Suite or our largest suite that is more than 60 sqm, The Hotel Norge Suite. All our suites have a terrace and fantastic views. The Hotel Norge Suite also has a sauna and a jacuzzi on the terrace, where you can relax and enjoy the great views over Bergen. Our 3 floors with exciting bars and restaurants contribute to making our hotel a modern meeting place, where local meets international in a lively and unique atmosphere. At restaurant Nova and Café Norge we combine the best ingredients Norway and Western Norway have to offer, with international flavours and techniques. Our food is signed by former Bocuse d’Or winner and our Chef Advisor, Ørjan Johannessen. Together with our Head Chef, Tore Espenes, he serves fantastic culinary experiences with a world flavour. Our chef advisor and winner of Bocuse d’Or Ørjan Johannessen, together with head chef Tore Espenes, will bring you exceptional culinary experiences. Bergen is a diverse and beautiful city with proximity to sea and beautiful mountains. If you want to experience Bergen at its best, we will gladly help you tailor a stay you will not forget. To get the most out of Bergen and your stay at Hotel Norge by Scandic, our Lifestyle Concierge is always available to help you experience that little extra. Welcome to 3 floors of exciting bars and restaurants that make our hotel a lively and vibrant meeting place in the heart of Bergen. Our food is signed by our chef advisor, winner of Bocuse d’Or, Ørjan Johannessen. Together with our head chef, Tore Espenes and our skilful team of chefs, he aims at offering extraordinary culinary experiences. 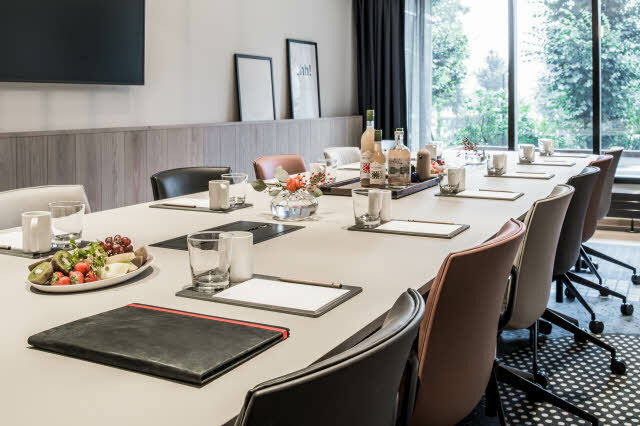 Our meeting studios offer high-tech, light and flexible meeting rooms, which create the perfect setting for any meeting or event with their large, beautiful windows and views of lake Lille Lungegårdsvann.